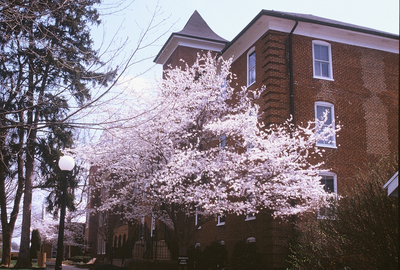 "Flowering cherry at the corner of Wardo Hall, about 1973" by L. Michael Hill Ph.D. Here is the same kind of early flowering cherry at the corner of what is now the “Wardo” end of Flory Hall. The great thing about these trees is that they flower early. Unfortunately, the flowers are short-lived if there is heavy rain or wind.